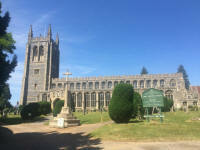 This, the first of the gatherings aimed at spreading the word and also the knowledge and interest in how to look after your bells, was held at Long Melford Church and attended by 19 people as well as members of the Belfry Advisory Committee. A good few ringers had expressed an interest in coming but were prevented from doing so by various other ringing commitments, mainly weddings. Jonathan attended the Bell Advisors Conference so that we had a representative there. The ‘Get Together’ was always envisaged as a low key, two way occasion so no speeches or lectures were arranged. 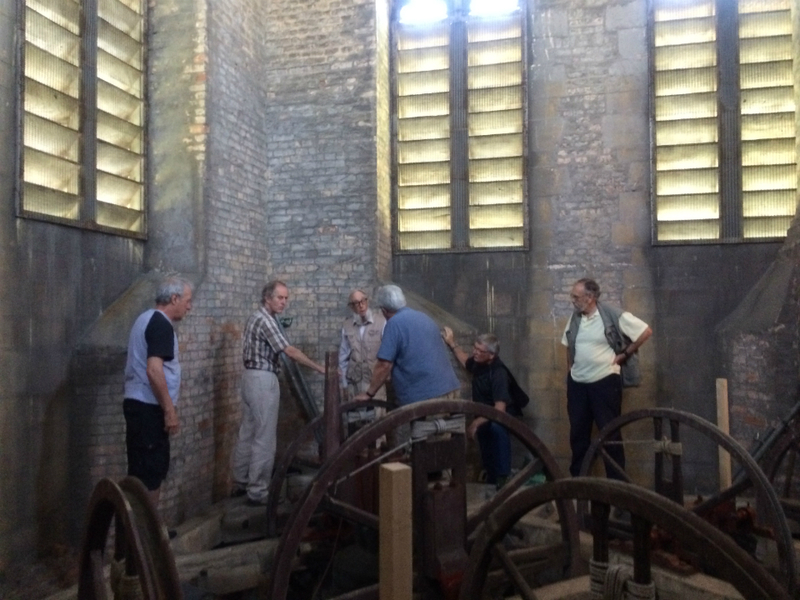 We started with an hour or so spent in the Church discussing the basics of looking after a peal of bells and this generated many questions and a lot of interest. 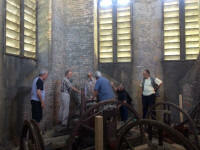 In fact, problems at some locations were identified and discussed including some of the bells at Palgrave where the clappers had seized solid during a recent peal attempt. This was because the clearances in the Nylatron™ clapper bushes were too small. A consequence of this was the clappers seizing solid as the bushes heated up. Unfortunately this problem is all too prevalent and removing the clapper and reaming out the bushes is the only solution to getting the bells back ringing as quickly as possible. 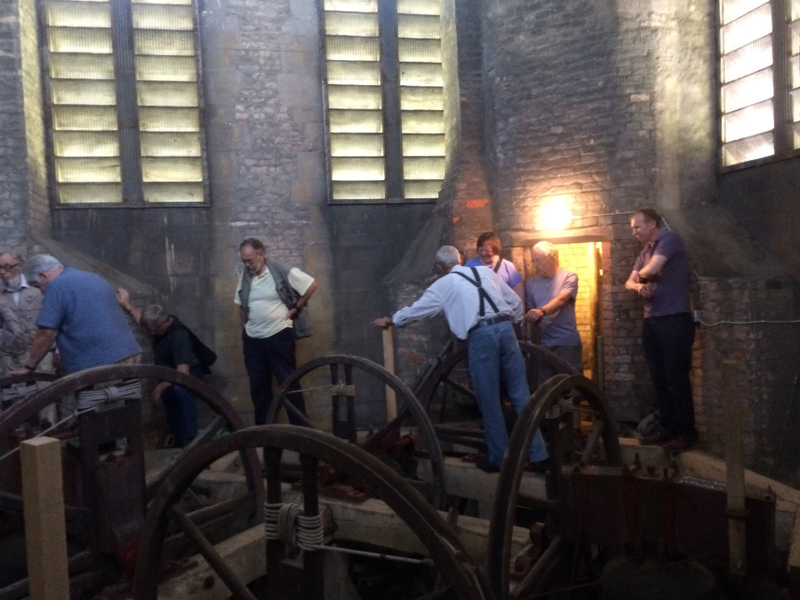 After the discussions a group moved up to the bell chamber where it was shown how a bell should be examined and what you need to do systematically to check all the nuts and bolts and moving parts. 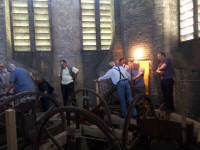 Derek Rose dealt with the clappers and spent some time under one of the bells showing how to establish clapper problems. At the same time down in the Church Nathan Colman demonstrated how to do a short splice and this attracted a lot of interest from the group. Penny and Derek Rose very kindly laid on an excellent lunch during which a great deal more discussion took place. Ringers had attended from all over Suffolk and came from as far away as Blythburgh. It was felt by all that the time spent was well worth the effort and all would be happy to come to any further maintenance gatherings that are arranged. It is hoped that these can be organised in other Districts of the Guild and I am hoping that perhaps the next one can be in the North East District if they will have us. It is clear that the Guild needs more ringers to be able to keep an eye on their own bells and to learn how they can do this confidently and expertly. This gathering indicated this very much and a greater spread of people making regular checks and either correcting them or, importantly, asking for help and advice if they are unsure of what to do, is much needed. Hopefully this will be the first step on that road. Grateful thanks to Penny and Derek Rose for organising the above in the South West District and organising and supplying lunch., To Nathan Colman for expertly demonstrating splicing, and also to Long Melford Church and ringers for allowing use of the Church and bells and making us welcome. The day concluded with a short ring on the bells.